Jaguars will be in attendance at both the fifth Kop Hill Climb (21-22 September) near Princes Risborough, Buckinghamshire, and the media launch for the 2014 East Coast Classics event, scheduled for next year at the Oliver's Mount street circuit in Scarborough, Yorkshire. 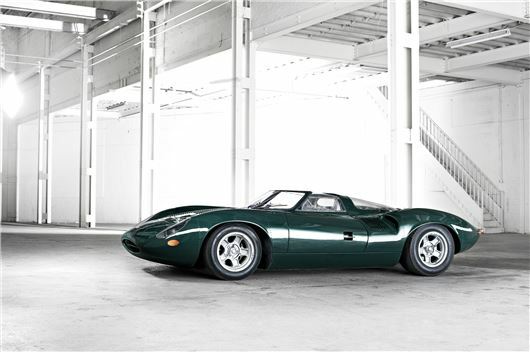 At Kop Hill, Jaguar Heritage will be showcasing the XJ13, with the car’s development driver Norman Dewis on hand. In addition, the 1984 European Touring Car Championship-winning TWR Jaguar XJS in which Tom Walkinshaw took four wins, plus one second and two third places, will be in action at the historic hill climb. Kop Hill will give the public what may be the last opportunity to see the famous Ecurie Ecosse collection (below) together in one place, ahead of its Bonhams auction on 1 December. This eight vehicle-strong collection includes a number of important Jaguars, including a 1952 XK120 Roadster, 1953 C-type, 1956 D-type and 1959 Tojeiro-Jaguar, as well as the distinctive double-decker 1959 Commer Ecurie Ecosse transporter. The new Jaguar XFR-S (below) will be tackling the Kop Hill Climb throughout the weekend event, as well as making a dynamic appearance at the media preview launch for next year’s East Coast Classic. The 2014 East Coast Classic will run to the theme of ‘What Makes Britain Great.’ The XFR-S will form part of a line-up of modern and classic British-built cars and motorcycles at the event preview – including a historic Jaguar C-type – to celebrate the best of British motoring. As the last remaining street circuit left in Great Britain, Oliver's Mount is best known for the many motorcycle races it has held over the years. However, less familiar are the cars that competed at the circuit site in the 1950s, including Formula 3 races.